PIVOT POINT is the point where the market reverses. It is a turning point. If the market is trading above Pivot Point it is considered to be a bull market (buyers are dominant), once it goes below the Pivot Point — it becomes a bear market (sellers are dominant). RESISTANCE is a high point in the market where buyers meet strong opposition of sellers. A rising market reaching resistance has big potential of falling back down. SUPPORT is a low point in the market where sellers meet strong opposition of buyers. A falling price reaching support has a big chance of climbing back up. 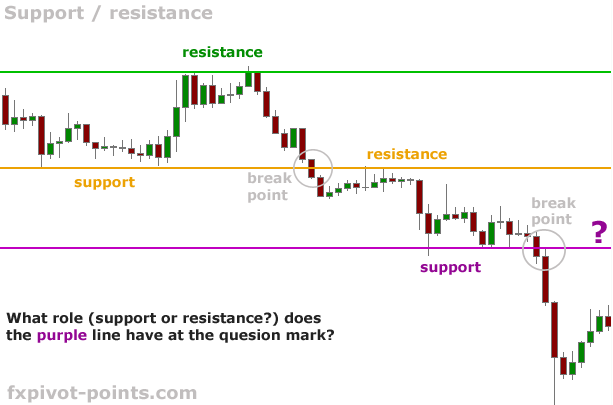 There is a rule that once a support or resistance level is broken it becomes the opposite force: a broken support will become a resistance, and a broken resistance serves as a future support. Pivot point trading emphasizes on the importance of such support and resistance levels and its theory is based solely around those levels.